9:22 going into the open the 110 EXMA using data from 6:15-4:15 Eastern is near 1352-well above prices. 4/11/2008 2:13:56 PM Mountain mm:: Al - thanks, but I have the 17th link as "SP 10 Day Moontides"
4/11/2008 11:20:48 AM Mountain jb:: Al, I checked the tutorials but I could not find what the purple tide lines at the bottom of the charts are. Is there a link or can you explain or is this only for paid subscribers? 4/11/2008 11:17:20 AM Mountain rnt:: Thanks Al, I owe a lot of my success to you! 4/11/2008 11:01:29 AM Mountain mm:: rnt - I don't see an Xtide2 chart in the List of Charts. Where is it? Is it restricted? 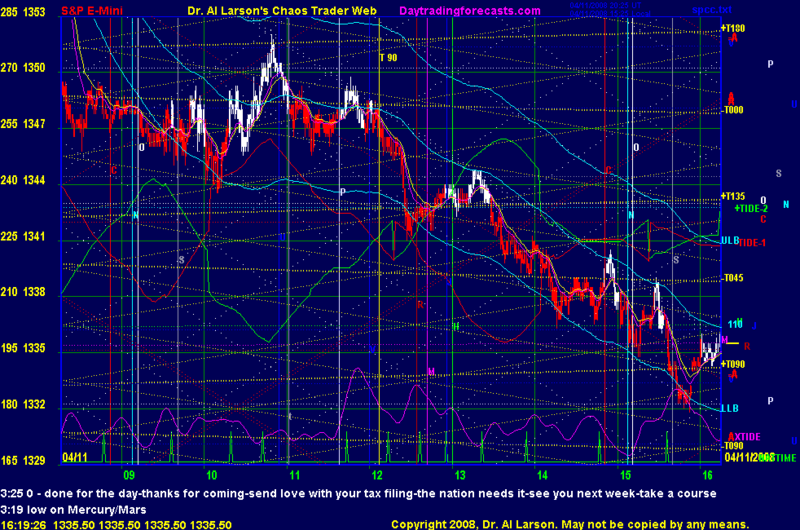 4/11/2008 8:10:59 AM Mountain rnt:: If you guys have a minute you should look at the Xtide2 chart. Amazingly accurate, taht is the roadmap I have been using for the past year and made a fortune!